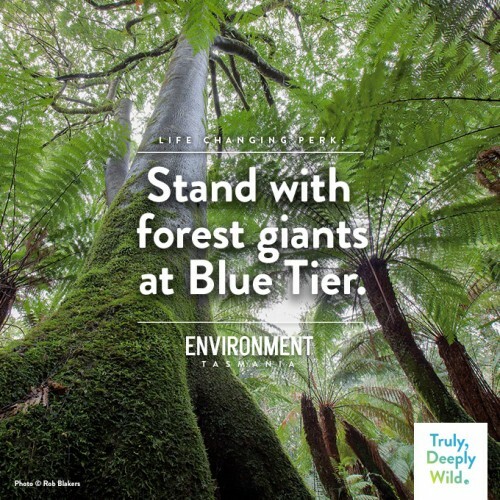 Help keep Tasmania Truly, Deeply Wild. Environment Tasmania is crowdfunding to continue our work protecting Tasmania's wild and special places. Tasmania is one of the last great wildernesses on earth. It is home to the tallest hardwood trees on earth, enormous tracts of temperate rainforest, seadragons and dolphins, kelp forests and sea caves. In just one decade Environment Tasmania has helped to protect many of these incredible places. But right now the Abbott Government has slashed some crucial funding. We need urgent help to ensure we can keep defending these wild, beautiful places and protecting our fisheries and dolphins from the threat of foreign super trawlers. The long and the short of it is, our small hard-working team needs your support to continue. All donations that do NOT receive a reward DO receive a tax deductible receipt (plus a truly warm, fuzzy feeling knowing that you are helping to protect some of the most spectacular places on the planet!). We're pairing up with some fantastic local businesses to offer you a life changing perk - some truly special experiences in some of the most beautiful places in Tasmania. So, for those of you with deeper pockets, let us take you to some of our most inspiring places. Environment Tasmania is the state's conservation council. We bring together 20 groups from across the state to provide grassroots conservation a strong public voice. We lead the national super trawler campaign, responsible for getting the last super trawler kicked out. Bringing fishers and conservationists together to protect our fisheries, our marine wildlife and fishing, we delivered an Australia-wide two-year ban on super trawlers in 2012. With your support we'll work to deliver a permanent ban that will protect our oceans from industrial factory trawling for good. We led the historic Tasmanian Forest Agreement between the forest industry, unions, environmental organisations and governments. This resulted in a 172,000 hectare extension to the Tasmanian Wilderness World Heritage Area. But more importantly, by closely involving our member groups, we created a process that transformed community debate over forestry. Now we are championing an open and collaborative approach to forest conservation - working with people, for forests. We're engaging with the Forestry Stewardship Council certification audit of Forestry Tasmania, advocating for good management of the World Heritage Area, and we led the call to protect habitat for endangered Swift Parrots through our report 'Pulling a Swiftie'. We are the only conservation NGO that combines courageous and collaborative advocacy with practical on-ground action. In the Styx, Florentine, and far south of the Tasmanian Wilderness World Heritage Area, we're restoring the tall wet forests. At Skyline Tier overlooking the magnificent East Coast beaches, we're converting failed pine plantations back to healthy bush. And we're building new short walks as well as track repairs, providing sensitive visitor access to stunning forests and ecologically diverse areas. We are also the only Non-Government-Organisation to run a permanent marine conservation program that is dedicated to protecting Tasmania's globally-significant and unique marine life. We run public awareness programs to help better protect our unique wildlife, and collaborate with fishers, scientists, industry and community leaders to achieve sustainable fisheries management a secure fishing industry for generations to come. Environment Tasmania is the state's conservation council, dedicated to the protection, conservation and rehabilitation of Tasmania's natural environment. We have 20 member groups who work across forests, climate change and marine conservation issues. Our Management Committee are members of these conservation groups, and combined with our team of regular campaign volunteers, provide much-needed support to our staff. Bec has led Environment Tasmania's marine program since 2009 and has over 13 years' experience as an environmental campaigner. She has an Honours degree in Environmental Science, and has worked on anti-nuclear, genetic engineering, and marine protection campaigns for international and local organisations including Greenpeace and The Wilderness Society in WA. Andrew is a seasoned campaigner, whose activism began with his work for various student unions and the National Union of Students. He has worked as Ministerial Chief of Staff for Nick McKim and the Tasmanian Greens, and with the Sea Shepherd Conservation Society, including two Antarctic Campaigns. Annette has worked in project management and natural area management roles for over 25 years. She worked as CEO for the Kokoda Track Authority, as ranger in charge of national parks in NSW and Tasmania, and on various rehabilitation projects including abandoned airstrips in the Tasmanian Wilderness World Heritage Area and restoration of river red gum forests and wetlands in NSW. Debbie is an administrative and business manager with experience working across conservation, the arts, law, education, human rights, science, IT, government and health sectors, for over 30 years. She has worked and volunteered for a number of conservation organisations in NSW, SA and Tasmania. Environment Tasmania is crowdfunding to continue our work protecting Tasmania’s wild and special places. Perk - knowing that you’re a part of protecting one of the most spectacular places on earth! You will also receive an Environment Tasmania sticker as a special reminder of how important your role is in achieving this goal. You’ll become part of our family of supporters and also receive a special handwritten thank you message from our Chairperson and a mention in our Island Voices newsletter. You'll also receive a sticker to remind you of your special role in protecting Tasmania's spectacular wild places! You’ll be part of our family, receive a special thank you from our Chairperson, and get a pack of stunning cards by renowned wilderness photographer Rob Blakers. Along with the sticker, thank you card, and public acknowledgement of your brilliant donation, you get to choose between the following wonderful coffee table books; 'Freycinet' by Rob Blakers and Professor Jamie Fitzpatrick or 'Wild Forest' featuring photography by 11 Tasmanian Wilderness photographers. Or if you’re in the mood for a read, we’ve also got Nowhere Else On Earth - a 100 page full colour report revealing Tasmania’s magnificent marine life. Along with the sticker, wilderness card set, and public acknowledgement of your awesome contribution, you’ll receive a beautiful hand made cheeseboard made by renowned local designer-maker Stuart Williams from Tasmanian timber. Along with the sticker, gift cards and lashings of public thanks for your wonderful donation, you’ll receive a beautiful unframed Rob Blakers wilderness print. Thanks to this renowned Tasmanian photographer, you'll be able to celebrate our wild places every day! Public proclamations of thanks, a sticker and card set will accompany this life changing experience. This walk showcases some of Tasmania’s most spectacular tall forest in the Blue Tier on our beautiful east coast. Local campaigner Lesley Nicklason will share her personal story about the years-long campaign to protect this area and why it so very special. Suitable for all ages, weather dependent. Picnic lunch featuring delicious Tasmanian produce. Along with the public praise, sticker, and card set, you'll get this life changing experience. 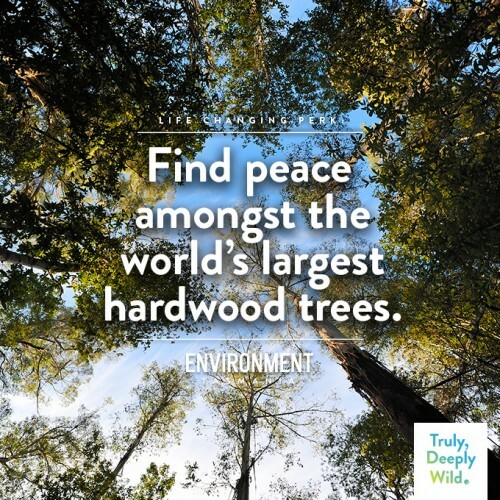 Immerse yourself in the wonder and wildness of Tasmania’s world-renowned and iconic high-conservation value forests. Guided by someone who has spent years studying our forest management and campaigning for their protection, you will walk amongst our ancient giants, the Tasmanian Swamp Gums (Eucalyptus Regnans), which are the largest hardwoods and flowering plants on Earth. You’ll enjoy lunch alongside a snow-fed river, surrounded by prehistoric mountain ranges that are home to Tasmanian Devils and Wedge-Tailed Eagles. Food and drink will all be locally sourced, as will be the expertise and passion. The walk will be accessible to novices and includes return travel from Hobart. You deserve this! Sit back and enjoy a weekend for 2 people to Maria Island on the luxury cruise boat Odalisque, sleeping on board, diving and snorkelling with a personal guide, eating gourmet Tasmanian food, and discovering Tasmania’s oldest and most famous marine reserve overflowing with large rock lobsters, reef fish and jewel anemones. 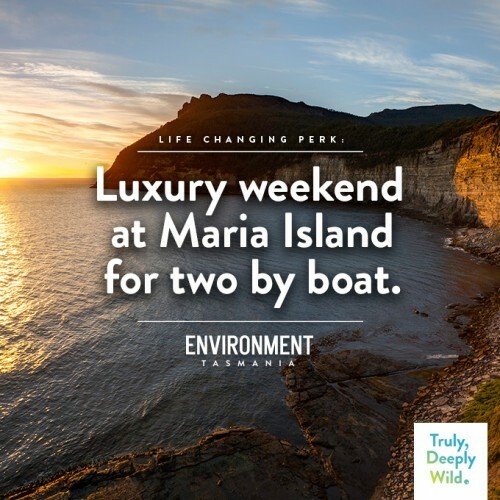 You'll have your very own personal guide and ocean expert and thanks to the support of Tasmanian Boat Charters, you’ll have a luxurious experience, travelling from Hobart. You’ll travel with up to 4 other marine discoverers. Weather dependent. Suitable for snorkellers, learners or experienced divers. This life changing perk also comes with waves of public thanks, a sticker and a copy of the 'Nowhere Else on Earth' marine report. * $35,000 in offline donations included in total. Get in touch with Help keep Tasmania Truly, Deeply Wild.